This Authentic Louis Vuitton Tan Suede Gold Monogram Theda PM Bag is an absolute steal at $1,198. The original price of this Louis Vuitton Theda was $2,995, so you are making a whopping saving of $1,198. The reason for this crazy good deal is that this Louis Vuitton Gold Theda bag is actually second hand, although you would never know it. The bag is in excellent condition, and frankly, is practically brand new. You may be thinking, hmmm, if I’m going to get a second hand Louis Vuitton bag, why not just go on ebay, and bag myself an even better bargain there? Well, the reason is this: ebay is notorious for selling fakes. I can vouch for this. I made the mistake of purchasing a Louis Vuitton on ebay, and once it was arrived the minute I laid eyes on it in the flesh I knew it was a fake. I naively thought, ok, maybe if I try again through a different seller, I’ll get lucky. This fake was even worse than the previous one. I even bought a Chloe Paddington bag on ebay, and it looked so real, I actually fell for it in the flesh (! ), until I took it to Saks Fifth Avenue in Beverly Hills to get an expert opinion, as it seemed too good to be true as the bag was so cheap. The lady there kindly informed me that it was a fake and showed me why (it was in the tiny details). So I have now been scarred, and will never buy designer handbags on ebay again. So if you are going to buy second hand, and want to be guaranteed of its authenticity and make sure that it’s in mint condition, then this site Portero Luxury is an absolute god-send. They sell high-end luxury designer goods at a fraction of the price. What with the current economic conditions, second hand is the way to go. What’s also amazing about this site is that they offer designer brands that do not have a retail outlet on the Internet. Portero Luxury offers a loophole for buyers who wish to buy exclusive brands like Louis Vuitton online. Most users go online to get discounts, so this is definitely your place if, like most, want a discount, but also want high-end designer wear. With this Louis Vuitton Tan Suede Gold Monogram Theda PM Bag you can’t go wrong. In my opinion, it is absolutely stunning. 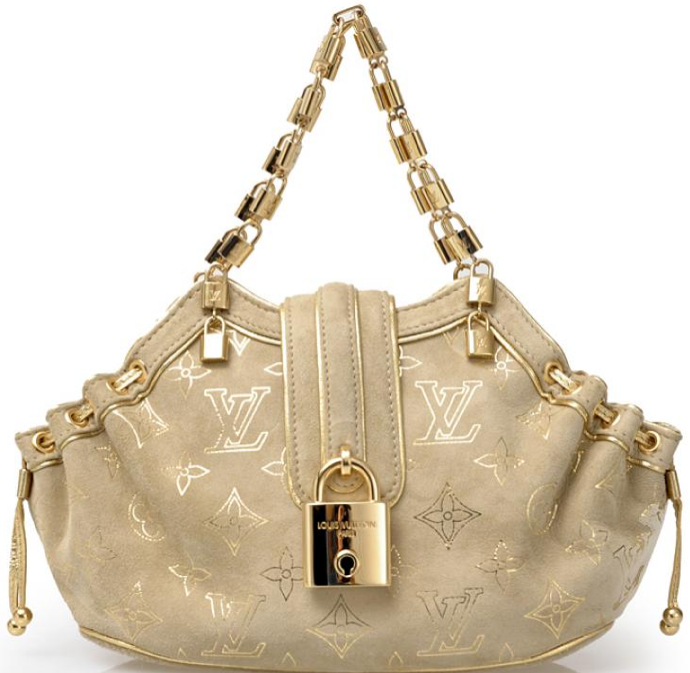 The beige color of the bag is perfectly complemented by the gold LV monogram accents. The gold chain is comprised of incredibly beautiful detailed mini gold padlocks. There are also two small additional padlock charms that hang at the bottom of the chain –very charming : ) The front of the bag features one large gold padlock. The drawstring on either side of the bag adds a cute touch to the bag. Overall, this Louis Vuitton Tan Suede Gold Monogram Theda PM Bag is an absolute beauty.